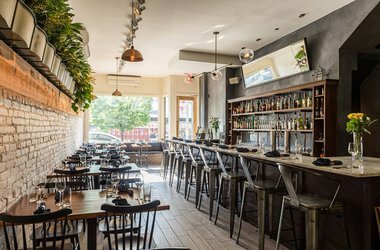 A Parisian-style restaurant from the folks behind nearby Maison Premiere that spills outside in warmer months. Along with chef Lisa Giffen, they’ve brought with them head bartender Will Elliott, whose unrivaled commitment to cocktailing means he keeps several types of ice and some hundred-plus small-batch liquors on hand. A South Williamsburg roaster where "farm-to-table" is almost an understatement. Beans are sourced (fair trade, of course) from select rural Colombian plantations and shipped to the U.S. within ten days. The huge space has a rustic-meets-industrial feel: high ceilings and concrete floors, exposed brick, wooden tables, and a plant wall. 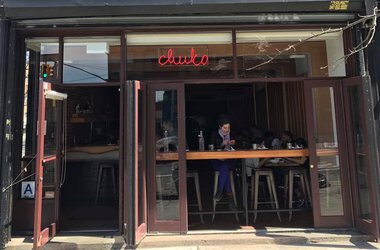 The most innovative coffee in Industry City, maybe even New York. They have all the latest equipment, most notably Steampunk vacuum brewers with glass canisters that give the coffee shop a real laboratory feel. A completely and meticulously restored Roaring Twenties merry-go-round encased in glass, a labor of love for 30 years and now a beloved Brooklyn gem. Take the kids for a spin while watching the views of the East River. Brooklyn Bridge Park, Dock St.
What's a trip to Brooklyn without a ride on the Wonder Wheel and the rickety wooden Cyclone, a picture in front of the Parachute Jump, a Nathan's hot dog, or at least one opportunity to say fugheddaboutit? Here we are, on the boardwalk, taking in the beach, the freaks, and the best of all Brooklyn worlds colliding. A 6,000 square-foot organic veggie garden built on top of a warehouse overlooking Manhattan. Hell yeah! Stop by during market hours (Sunday afternoons) and pick up your very own Brooklyn-grown produce. Right on pier 1 of Brooklyn Bridge Park, a barge-turned-concert hall floats on the East River and gives intimate chamber music concerts all year round. 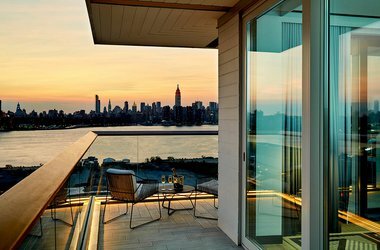 The unique venue and incredible Manhattan views intensifies the experience. After completing Central Park, Frederick Law Olmsted and Calvert Vaux set to work on 585 acres of pastoral charm. There are impressive watercourses, Neoclassical structures, bike lanes, and walking paths. The park is flanked by the Brooklyn Public Library, Brooklyn Museum, and Brooklyn Botanic Gardens. An excellent farmers market is held every Saturday morning at the park entrance. Pack a picnic and head to the fields. 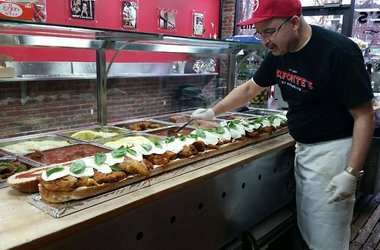 Everyone loves to get to Dumbo via the Brooklyn Bridge, which means you'll land on the BK side right up the block from Patsy Grimaldi's pizza joint, Juliana's. Walk down to Brooklyn Bridge Park and pick up an ice cream cone at the water's edge or stop into The River Cafe for champagne in the garden. 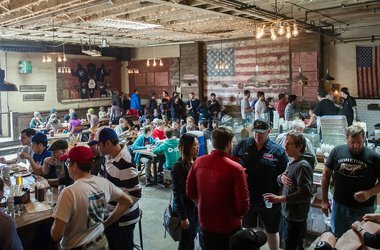 St. Ann's Warehouse is where to go for the next big thing in theater. 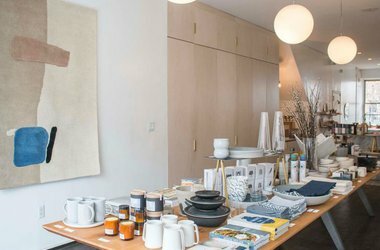 Other stops not to miss: Powerhouse Books for something artsy, Jacques Torres for something chocolately, Cecconi's for a drink with a view of the bridge, and One Girl Cookies for tasty souvenirs. Known as BAM, the multi-arts center is home to highbrow dance, theater, film, opera, music, literary readings, and all kinds of un-classifiable performances that mix media and blow minds. A forward-thinking museum and vast space that's known for it's Target First Saturdays, a free free-for-all with art, programming, live music, and the kind of family friendly dance party that can only happen in BK. If you can make it in time for cherry blossom season, you will be in for quite a treat. Hundreds of trees bloom on the great lawn every spring. Spend time making your way down winding paths, through lilac groves, around water features, and into the beautiful glass greenhouses to check out indigenous and tropical flora and fauna. Foodies flock to the perimeters of this soccer field, where dozens of food carts dish out gargantuan portions of the best Mexican, Guatemalan, Colombian, Honduran, Dominican, and Ecuadorian tacos, grilled corn, ceviche, pupusas, plantains, and horchatas. Dine at picnic tables and digest on the bleachers. A Blue Hill at Stone Barn alum and a former horticulturalist team up to build a cozy neighborhood restaurant with a living wall, a backyard garden that occasionally hosts animals and guests waiting for tables, and a serious, seasonal, envelope-pushing menu. Typical Brooklyn farm-to-table establishment, this is not. When you can’t afford a tropical vacation, trek to this low-key, tropical-looking spot from the team behind Van Leeuwen's Ice Cream (random!) for beautiful, healthy, vegetable-heavy takes on Balinese classics, like green papaya salad, pumpkin coconut curry, and umami-rich nasi goreng. 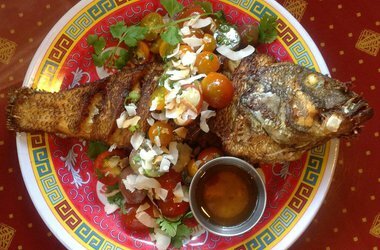 A desolate dead end in an industrial swath of northeastern Williamsburg is the last place you’d expect to find an airy, vibrant Vietnamese street food joint brimming with colorful lanterns and a cool, in-the-know crowd. Yet here it is, serving delicious pho and banh mi, properly-roasted meats and whole fish, and a nice selection of tasty vegetarian alternatives. Fire takes center stage at this South American-inspired neighborhood gem helmed by Francis Mallmann alum Norberto Piattoni. Pull up to the beautiful bar, order a house-made elixir, and watch the kitchen’s pyrotechnics take to your sourdough, sweet potatoes, lamb, and steak. A go-to for serious bread connoisseurs, the artisanal bakery sells French staples like double-baked almond croissants, fresh-out-of-the-oven baguettes, and decadent eclairs, all proudly baked with local ingredients the old-fashioned way. 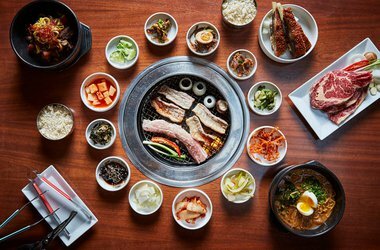 Brooklyn’s cathedral to barbecue has two bars, live music, and a mouthwatering selection of oak-smoked meats, classic Southern sides, and community-inspired flavor bombs like Jamaican jerk ribs, Vietnamese hot wings, and brisket tacos. 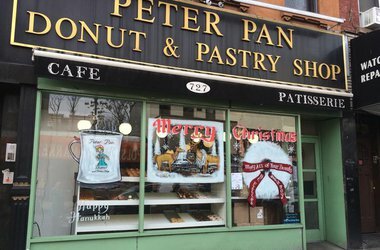 The neighborhood mainstay has been dishing out deeply satisfying donuts in more than twenty classic varieties since 1952, long before Brooklyn’s other doughnut sensation, Dough, entered the fray. Drop in once doors open at 4:30 a.m., observe the yentas chatting, and order from the cute Polish girls dressed in old-school uniforms behind the counter. Here, everything, including the prices, is wonderfully lost in time. 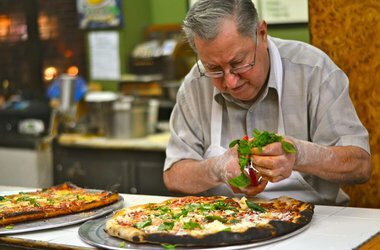 Not much has changed since Domenico DeMarco opened his legendary pizzeria more than half a century ago — the master pizzaiolo still hand-makes every pie that comes out of his shop (very, very slowly: he's in his '80s); pizza fiends still brave the crazy long lines for a taste. 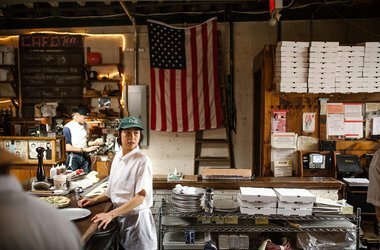 A permanent outpost in Williamsburg’s North 3rd Street Market will help alleviate the wait, but nothing will replace commuting to Midwood in the name of NYC’s most storied slice. Everything at this lively, dimly-lit restaurant is fresh, delicious, and vegan. Order an Ethiopian feast (for two, three, or four) and receive the menu’s best dishes over a base of tart injera. 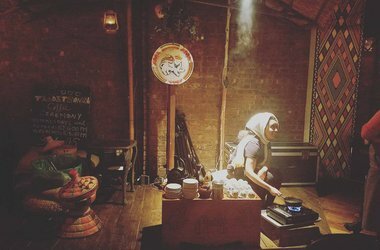 For your buzz, there’s regular live music, Ethiopian beer, cocktails, and honey wine, and soul-warming Ethiopian coffee, which is poured as part of an elaborate and traditional coffee ceremony — for free. File this under "magical NYC experience," and dress to impress. 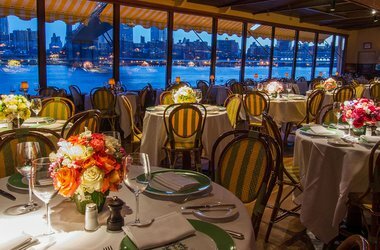 The classic white-tablecloth restaurant is tucked under the Brooklyn Bridge and has million-dollar views of Manhattan. Order champagne in the garden and don't leave without ordering a chocolate rendition of the famed suspension bridge for dessert. 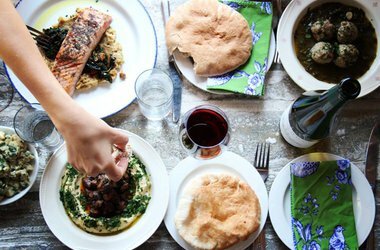 A mother-daughter team welcomes you home to their lively neighborhood spot where Arabic music, clinking glasses, and platters of mezze (stuffed grape leaves, Armenian sausage, fattoush) swirls around in one cacaphonous family reunion. This minimalist, sake box-size noodle shop slays it with spicy chicken wings, fried brussel sprouts, and incredibly rich bowls of ramen. 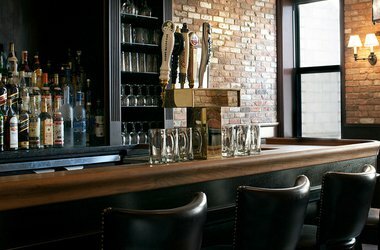 If there's a wait, whet your whistle with a drink at Weather Up bar across the street. 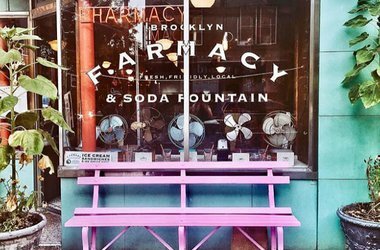 An old-fashioned pharmacy is now an old-fashioned-looking soda fountain and sundries shop. Soda jerks with cute paper hats delight kids of all ages with seasonal ice cream floats, shakes, sundaes, and classic egg creams. 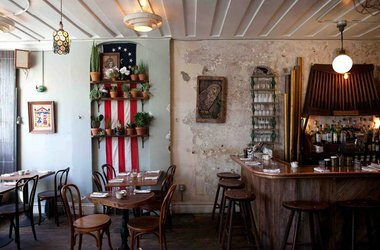 Off the beaten path (which is tough to say in well-trodden NYC), in the historical Navy Yard area, is a delightfully ramshackle little restaurant, perfect for cold nights and meals served in cast-iron skillets. Sure, the cocktails are carefully made and the mustaches carefully combed, but the style has substance to match. And the hidden street is a real gem. This cobbled-together pizza joint means many things to many people. It's part farm lab, part Heritage Radio station (broadcast from a shipping container), part high-brow kitchen experiment, and all-around Bushwick community center. Back in the day, when Williamsburg was mostly an uninhabited industrial mass, and even before that (circa 1887), this steakhouse was still packed every night of the week. 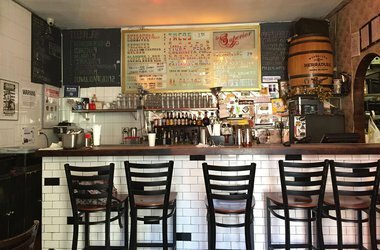 These days the hipster scene (including plenty of Luger clones) has developed all around it, but the ol' stalwart has kept its authentic old-school charm: incredibly bright lights, dressed-up gentleman servers, and the killer (and affordably priced) 1/2 pound Luger Burger at lunch. It's small, cheerful, and well-designed; you'll feel like a house guest. Mimi Kitani turns out incredible hummus, chickpea dishes, root vegetables, and more that nod to her family history in Israel, Morocco, and the Kurdish region of Iraq. Thankfully, her homemade provisions are available to-go (stock up!) at her market next door. 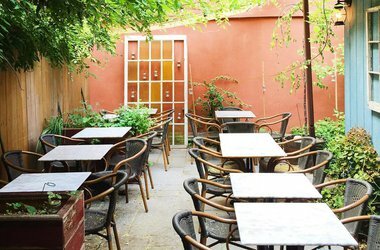 A lively, cozy tapas restaurant with a focus on the culinary contributions of Jews and Muslims on the Iberian Peninsula. You'll notice footnotes to history in plates of delicate artichokes, Arabic noodles, and skewered chicken hearts. But mostly, you'll just order one of everything on the menu and think to the future: Torta de Santiago for dessert. The cult sandwich shop has been delighting mamas' boys since 1922. Arteries tingle with joy for scratch-made mozzarella and fried eggplant, sausage-and-pepper combos, and pickled veggies piled high on crusty loaves. Fraternize with good old Italian Americans and make yourself a regular. Just over the Williamsburg Bridge, this tenacious seasonal restaurant plays to a local, loyal fan base and inspired the New Brooklyn Food Scene. Bodega in front, saloon-style oyster bar in back. Menu is rotating cast of specials. Same goes for Diner, their lively spot next door. A dining establishment with a Clark Kent-Superman complex. By day, a humble grocer. 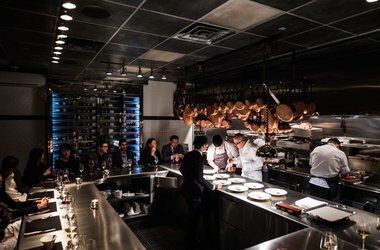 By night, a big-buzz, 18-seater for chef Cesar Ramirez's three Michelin-starred, avant-garde tasting menus. Reservations need to be made six weeks out. A bustling taqueria/hip roadside diner serving delicious masa snacks (tacos, gorditas, spicy pork, tortas, top-notch condiments) with a casual cool (crowd, music, service). 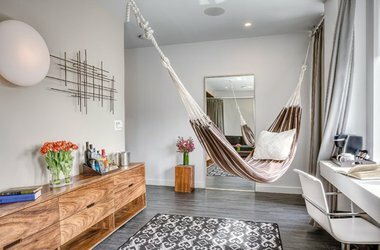 Tea-time, tuk tuk service, beautiful bathrooms, and a fancy rooftop pool are distinguishing features of the boutique property in an easy-to-reach part of Williamsburg (it's also close to the borough's other boutique hotels). 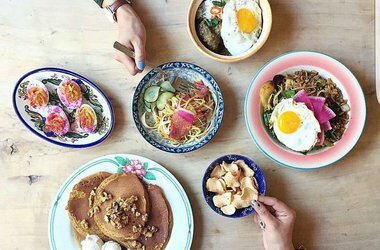 There's a restaurant-focused restaurant, cozy design-focused rooms, and plenty of Instagram potential at the bar. 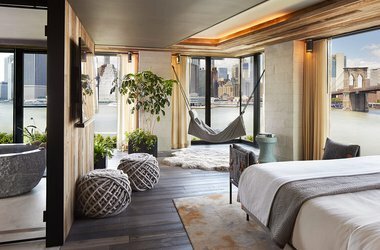 Dumbo's first hotel has a prime waterfront address, incredible views of Manhattan, and an organic, shipyards-inspired aesthetic. The rooms are small but smart and sustainable. The public spaces are made for lounging, socializing, drinking, eating, omm-ing, and photographing. Doors spill out onto BK Bridge Park, so take advantage of the great outdoors in the urban environs around you. A splashy new tower at the northern end of Williamsburg. The views are crazy, but so are the crowds — especially at the 22nd floor rooftop bar. 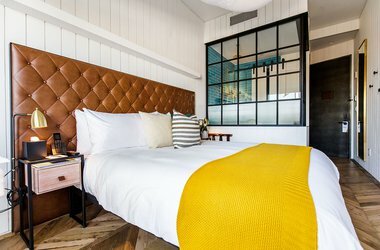 There are 183 nicely designed rooms with floor-to-ceiling windows, a restaurant, an Airstream food truck, an outdoor pool (and accompanying pool party scene), and cultural programming (rooftop films, fitness classes, live comedy shows). 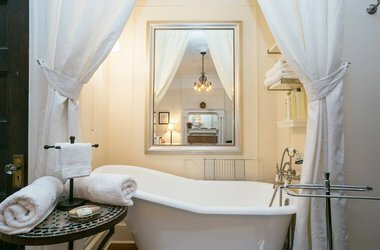 For an intimate bed and breakfast accommodation and neighborly vibe, look no further than this clever little retreat in the middle of a mostly Italian section of Williamsburg. 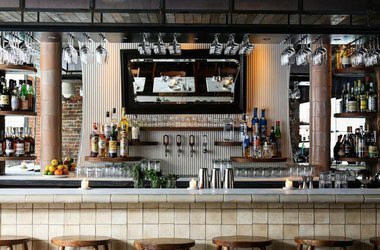 The townhouse is a handsomely decorated and earnestly hip — giving visitors a slice of that capital B Brooklyn experience they've heard so much about. 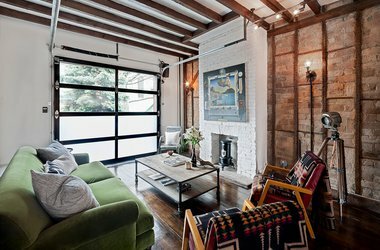 The Treehouse, located down the block, has two bedrooms, a private patio, and views of the Williamsburg Bridge. 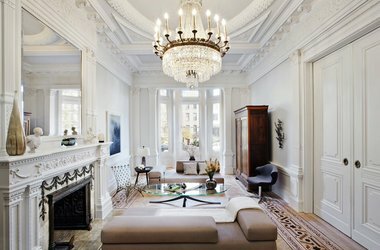 This AirBnB property, a restored 1887 brownstone on a tree-lined street, is owned by a private family who lets rooms for the short term. It's beautifully decorated and walking distance to restaurants, bars, parks, and BAM cultural center. Breakfast — prepared by the owner using organic ingredients — is served every morning in the dining room. This well-appointed historic brownstone B&B might be a little off the beaten path for most tourists, but it's a stone's throw from Brooklyn's best hyper local institutions: Prospect Park (built by Olmstead after Central Park), Brooklyn Museum, Brooklyn Botanic Garden, Brooklyn Library Main Branch, and the fabulous Saturday morning Grand Army Plaza Greenmarket. A somewhat generic business hotel tries a little harder in Brooklyn (note: Basquiat references, chalkboard paint, in-room hammocks). 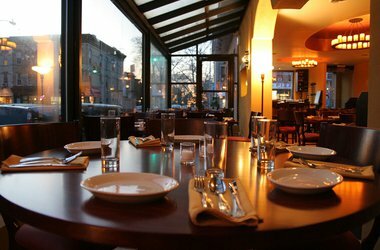 It's affordable, in a nice neighborhood that's not Williamsburg (where most of the hotels are located), and very accessible to Manhattan. 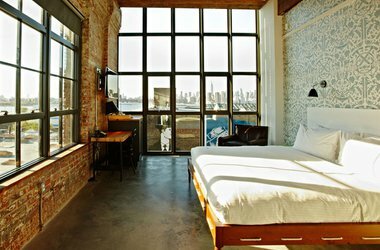 An old factory on the waterfront epitomizes New Brooklyn Style. It's industrial, farmy, laid-back-but-high-end, renovated, rediscovered, and topped with a roofdeck bar. 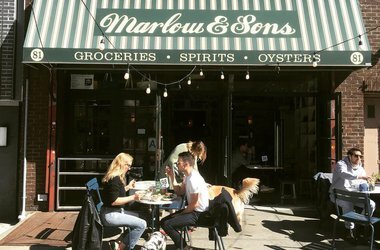 A happening restaurant from Marlow & Sons proprietor Andrew Tarlow is filled with folks from Manhattan finally making the trek to the borough of dreams.